The purpose of this study is to investigate the diagnostic potential of color-coded Doppler sonography (CCDS), power-Doppler (PD) and B-flow ultrasound in assessing the degree of extracranial internal carotid artery (ICA) stenosis in comparison to CT-angiography (MD-CTA). Thirty-two consecutive patients referred for CTA with 41 ICA-stenoses were included in this prospective study. MD-CTA was performed using a 64 row scanner with a CTDIvol of 13.1 mGy/cm. In CTA, CCDS, PD and B-flow, the degree of stenosis was evaluated by the minimal intrastenotic diameter in comparison to the poststenotic diameter. Two radiologists performed a quantitative evaluation of the stenoses in consensus blinded to the results of ultrasound. These were correlated to CTA, CCDS, PD and B-flow, intraoperative findings and clinical follow-up. 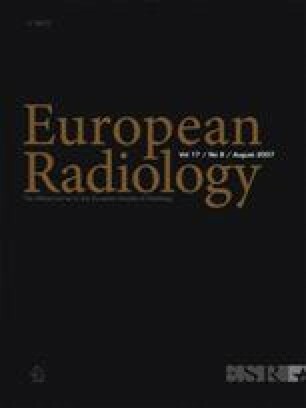 Grading of the stenoses in B-flow ultrasound outperformed the other techniques in terms of accuracy with a correlation coefficient to CTA of 0.88, while PD and CCDS measurements yield coefficients of 0.74 and 0.70. Bland-Altman analysis additionally shows a very little bias of the three US methods between 0.5 and 3.2 %. There is excellent correlation (coefficient 0.88, CI 0.77–0.93) with 64-MD-CTA and B-flow ultrasound in terms of accuracy for intrastenotic and poststenotic diameter. Duplex sonography is useful for screening purposes. Clevert D.–A. and Johnson T. contributed equally to this study.